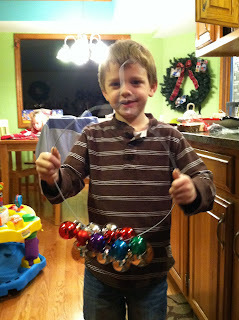 This week's RWOP installment was inspired by this tutorial for making a wreath out of Christmas balls. Since the smallest Small is obsessed with balls, and likes to pull all spherical objects he can reach off the Christmas tree, we had a lot leftover when we finished decorating this year. I really thought this looked easy. Just requires a wire hanger and some ball ornaments. You unfold the hanger, shape it into a circle, then string the balls on by their loops. Twist the wire back together, and hang! As usual, I thought I could somehow rig my own version of this craft, and that I wouldn't necessarily need the EIGHTY balls that were recommended. Seriously. Who has eighty balls just lying around, or is going to buy eighty balls for a wreath? When will I learn though, that crafting is not cooking? I really can't always just improvise with what I have, unless I'm willing for the end result to look a little forlorn. Anyway, here is where the initial magic happened, on my kitchen counter. You are supposed to hot glue the top onto each ball so that they don't fly off when you start stringing them on the hanger. Again, I thought maybe this was overkill. But then I strung a few on, and the minute I tried to touch any of them: Yes. They fell off. So hot glue it was. A little tedious, but not too bad. O. helping me with the stringing of the balls. I did try to pay attention to the pattern of color and size when stringing them on, as I would do when making a bead necklace. Okay, I don't have any of the in between shots of this project, where I ran out of balls, tried to hang it up anyway with the top third of it basically bare. The problem with trying to use less balls and reshape is that the balls are not very flexible, and tend to burst into a billion smithereens if you mess with them too much. Also, the weight tends to fall towards the bottom, making it impossible to spread them out just how you'd like. Sooo. I went and bought some new balls. Target had some in the dollar spot, luckily. But, it meant I had to unstring all of my old work, so as to redistribute the new color palette. J. helped me twist the wire more securely than I could do with my fingers. You use the original hook from the hanger as your wreath hanger. You'll see here that I have covered up the remaining bare wire with a very cheap looking bow. All the ribbon I had was too translucent when I made my own bow, so I went with the pre-made 99 cent bow from Michaels. Kind of fits with the retro/dime store feel that the whole thing ended up having. Here it is hanging on the inside of my front door Might look better on a solid door than my glass one, for contrast. So, here's a poor quality closer-up view on my living room chair. Not awesome, but not too bad. I miss the extra sparkle all of these ornaments gave our tree, but I'm sure J. is glad we may not have an entire box devoted to "Ornaments: Balls" to put away this January! This is my weekly Real Women of Pinterest post. What are you pondering producing on Pinterest lately? Would you like to share? Email me your photos, or if you're a blogger, link up below! Linked & read earlier, but didn't have time to comment. I cannot thank you enough for not doing this perfectly. I can't tell you how many things I try to recreate that don't turn out just right. I think the wreath looks good! Definitely sounds like more work than I'd want to give. Thanks for posting. And, I LOVE your kitchen backsplash. Ballsy, indeed, but the final product if far from forlorn! I think it looks great and admire your guts in working with fragile materials. I love it, challenges and all. And I have to say that I loved that pin, but I'm glad you tried it first. It's definitely more work than I've got in me lol. I agree with MEP, it's definitely not forlorn, it's beautiful.